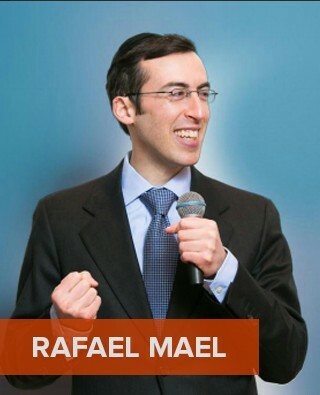 Rafael Mael is a strategist, advisor, and president of Maelstrom Marketing. His approach lasers in on innovative marketing ideas that generate leads, sales, and profits. Rafael is an accomplished speaker who has electrified audiences with keynotes and breakouts, at events from exclusive business summits to international expos. His presentation style has been described as “magnetic,” and he delivers practical action steps that attendees can immediately use. Rafael Mael holds a Marketing MBA from Johns Hopkins University Carey School of Business. He lives in Maryland and is an avid swimmer. When it comes to driving business, there’s plenty you could be doing… but what should you be doing? If you’re like most business owners, you’re overwhelmed, and you just want to know what works best for the least amount of money. Join this keynote and discover brilliant promotional ideas to duplicate and proven strategies to adopt — as well as trendy ideas to skip and marketing initiatives to avoid like the plague. Marketing isn’t about manipulating people; it’s about cultivating relationships. Relationship Marketing requires a step-by-step process, but it works! This keynote will open your eyes to the tools and techniques of Relationship Marketing so you can start reaping the rewards in your own business. The #1 obstacle business owners face when it comes to social media isn’t money — it’s time. Social media can devour your time, with only hazy, feel-good outcomes. Until now! This social marketing keynote assumes you have no time, and shows you how to make it happen anyway. Find out how to monetize social marketing without the time-wasting. There’s a way to cut through the fog and get the attention of your prospects. It’s the power of metaphors — visual words that “show” exactly what you mean. You probably use these effortlessly in your personal life: Ike is built like a Mack truck; Debbie has the temper of a rhino. But using them in your marketing can have a dramatic impact on your bottom line. Learn how to use metaphors to perk up your prospects, get your ideas past the ‘wall of skepticism,’ and seal the deal with the perfect message.